This post is the second part of our wildly successful trip to Yellowstone National Park for the July 4th weekend (Our previous July 4th weekend trip was to Rocky Mountain National Park). You can find the previous post here. After visiting the most picturesque Lamar Valley and the most memorable Mammoth Hot Springs on Day 1 followed by several thrilling geysers and an expansive Yellowstone Lake on Day 2, there is lot more left to explore in the Yellowstone National Park. On Day 3, we went to the Upper Falls, Lower Falls and the Grand Canyon of Yellowstone and grand it was! The view from Artist Point, in particular, was amazing. After trying immensely to capture its grand beauty in our tiny cameras, we headed out of the park early to move to our second cabin situated on the top of a hill in Gardiner. The details about this exclusive cabin will follow shortly. Meanwhile, let me share with you another wonder that I witnessed in the Park which to me could easily top the list of the most memorable moments of my life until then. And it was the double rainbow. No adjectives to describe it, if you notice. Trust me, I was out of words! I shook with excitement!! Like never before!!! But I can give you a brief background. 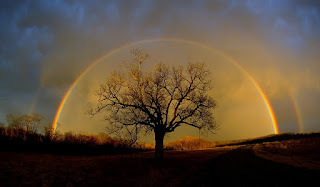 About 8 years ago, I saw a couple of photographs of a double rainbow clicked by some photographer at Elam Bend, McFall, Missouri. I was in complete awe of those pics and never thought I would see such amazing thing in my lifetime. Here are those pics. 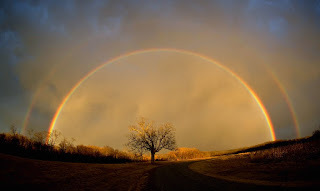 A rainbow in the sky"
I hate my camera at this point! That was my last hour at the Yellowstone Park during that trip and it was the best-est parting gift. Our trip, however, did not come to an end. We then moved to our second cabin, which was a log cabin located on the top of a hill at an altitude of 7800 feet. It was built by Malcolm Forbes who bought a huge area on the top of the hill and set up this cabin to give it a secluded and unique feel. The cabin as well as the views were pretty cool. We spent our Day 4 in this cabin, playing Frisbee in the front yard, enjoying the fresh air and the views from the balcony, relaxing inside the cabin, reading books, playing cards, barbequing and eating lots of food. After a good night's sleep, we departed to our respective destinations the next morning, taking with us memories forever. Thus went our successful trip to the unique and most wonderful Yellowstone National Park. What are you still waiting for? Pack your bags and go, if you already haven't! I would gladly provide you with more information.